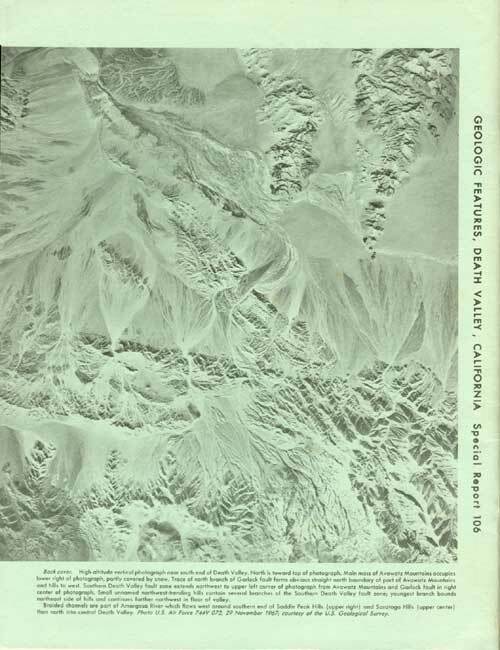 High-altitude oblique aerial photograph oriented west-southwestward across north-central Death Valley. The crest of part of the Panamint Range lies beneath the string of clouds just beyond central Death Valley. Tucki Mountain is directly under small cloud near center of photograph. Small dark patch on right edge of symmetrical alluvial fan barely left of center of photograph is Furnace Creek Ranch. Mass of clouds at upper right are near Mt. Whitney in the Sierra Nevada. Funeral Range occupies foreground. Photo U.S. Air Force 018R 191, 10 July 1968; courtesy of the U.S. Geological Survey. High-altitude vertical photograph near south end of Death Valley. North is toward top of photograph. Main mass of Avawatz Mountains occupies lower right of photograph, partly covered by snow. Trace of north branch of Garlock fault forms obvious straight north boundary of part of Avawatz Mountains and hills to west. Southern Death Valley fault zone extends northwest to upper left corner of photograph from Avawatz Mountains and Garlock fault in right center of photograph. Small unnamed northwest-trending hills contain several branches of the Southern Death Valley fault zone; youngest branch bounds northeast side of hills and continues farther northwest in floor of valley. Braided channels are part of Amargosa River which flows west around southern end of Saddle Peak Hills (upper right) and Saratoga Hills (upper center) then north in central Death Valley. Photo U.S. Air Force 744V 073, 29 November 1967; courtesy of the U.S. Geological Survey.